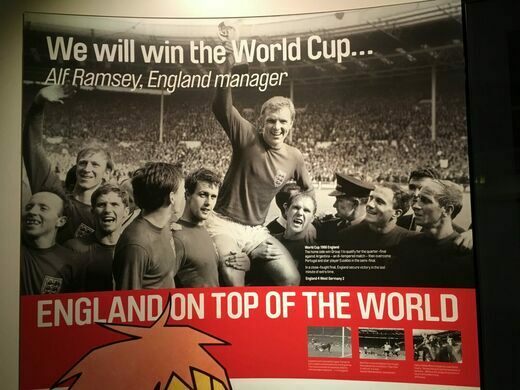 On June 29, 1966, England won the World Cup by defeating West Germany with a final score of 4-2. Their victory and the country-wide celebrations that followed were as authentic as could be. But the trophy England proudly held for the next four years was fake. In March of 1966, soccer’s most coveted prize was displayed in an exhibition at Westminster Central Hall. Somehow, a sneaky thief managed to steal the trophy. 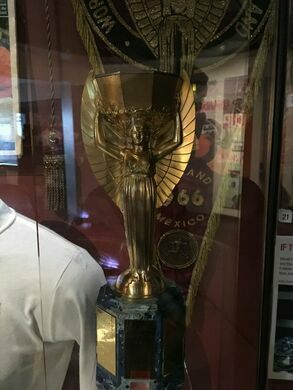 With only months until the tournament began, the Fédération Internationale de Football Association (FIFA) secretly made a replica of the Jules Rimet trophy, which was used in the World Cup from 1930 to 1970. Fortunately, the real trophy was “sniffed out” by a curious dog named Pickles before the World Cup began. Whoever had stolen the cup must have gotten nervous, wrapped it in a paper bag, and pitched it into a suburban hedge garden. Pickles the dog became a national hero, and the culprit who stole the trophy was never apprehended. Thanks to Pickles, both trophies were at the tournament. 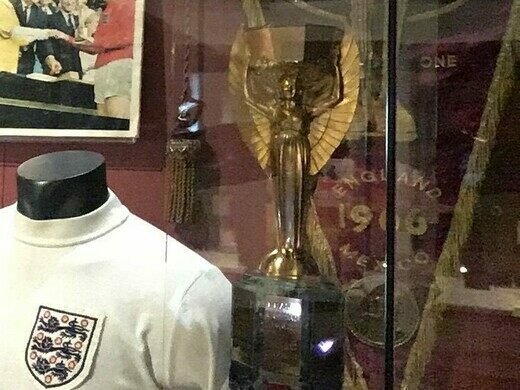 According to the National Football Museum, it’s believed that Queen Elizabeth II presented team captain Bobby Moore with the original prize, but it was later switched out for the replica. The fake trophy was then featured in all public appearances up until it was secretly returned to its creator before the start of the next World Cup. But that isn’t where the strange saga ends. 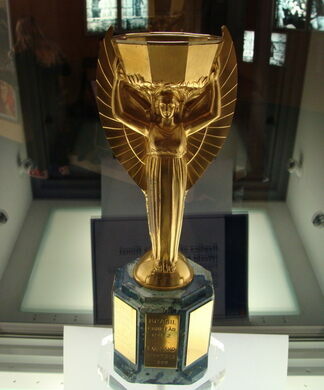 The original Jules Rimet trophy was permanently given to Brazil after the country won its third World Cup in 1970. The cup was then stolen yet again in 1983, this time for good. 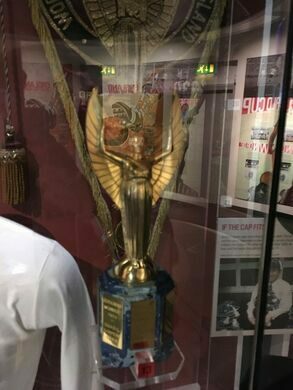 Now, the replica trophy is the only surviving version of the official Jules Rimet trophy. Years later, FIFA repurchased the replica trophy at an auction for 254,000 pounds, raising suspicions that it may have been the original all along (though that theory was disproved in 2016). 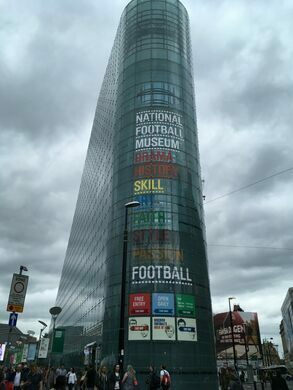 The fake cup was eventually donated to England’s National Football Museum in Manchester, where it is currently on display along with the game ball and jerseys used. 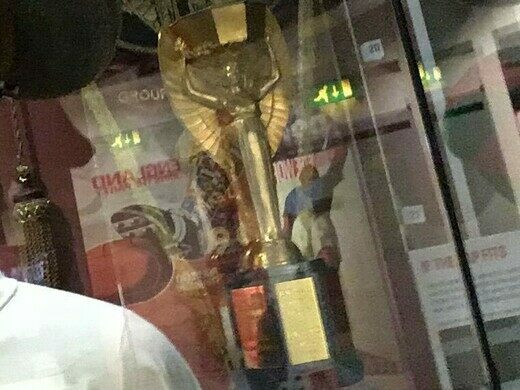 While at the museum, take as many pictures of the 1966 World Cup trophy as you like, but don't bother trying to steal it, as it’s protected and safe behind thick glass.